As the days begin to lengthen and the sun starts streaming in through your windows, it can be refreshing to make a few small updates to your home. Adding a warm farmhouse summer decoration here and there is a simple way to liven up your space. Plus, longer, warmer days often means more time for those craft projects and home improvements that you’ve been dreaming about all winter long. Well dream no more. It’s time to find some inspiration, visit that nearby vintage shop, and start cranking those crafty gears of yours. These 32 farmhouse summer décor ideas will remind you why summer is such a lovely time. 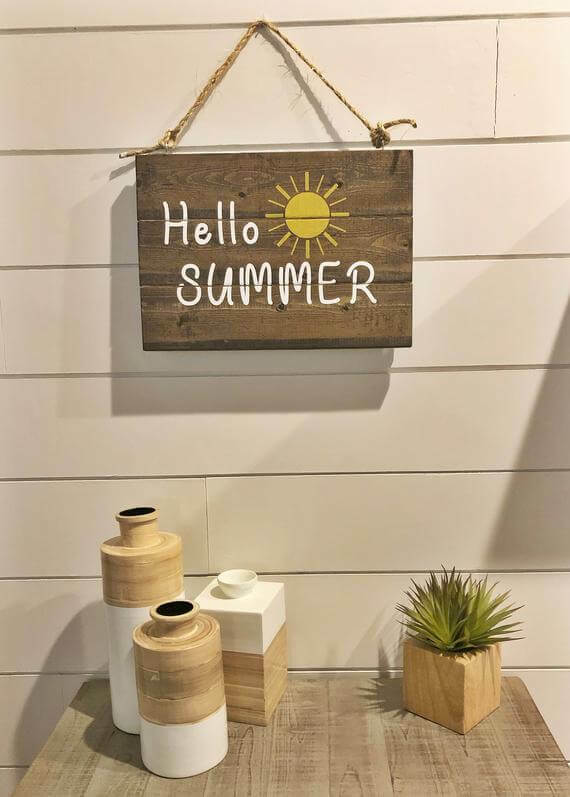 The lightness, the brightness, that warm care-free feeling – the same things we love about summertime are what make these decoration concepts so magical. What’s extra special is that, with a little resourcefulness, many of these projects can be done or adapted on a budget. You don’t need to spend hundreds of dollars or hours upon hours redecorating for every season when you have clever tips and tricks like these. Browse these original farmhouse decoration ideas for inspiration, and then put away that device and get designing. After all, summer is calling, and it’s not going to wait up. Even farmhouse decorations should have flashes of color. This vertical welcome sign for summer offers just that. With a deep blue color, it invokes a feeling of summer. 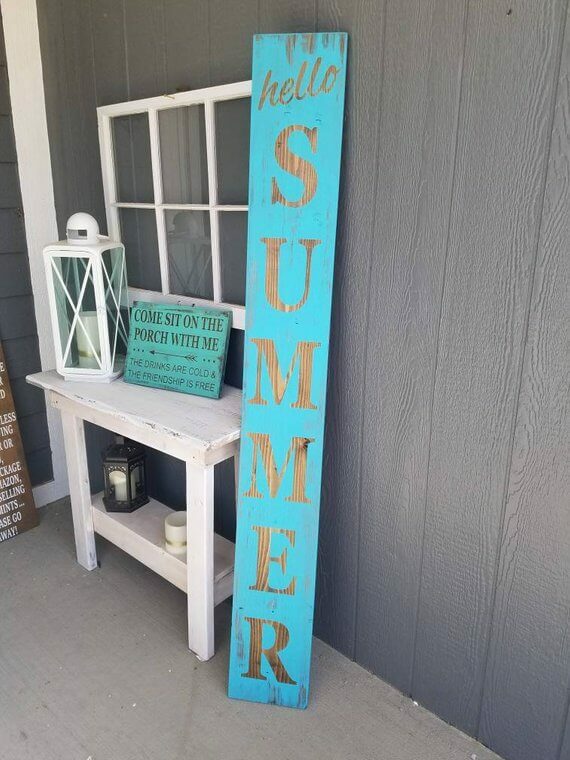 It almost crosses into the beach aesthetic, but the wooden material and the letters that expose the wood through the absence of paint clearly makes this sign perfect for a farmhouse. What would summer be without an annual lemonade or lemon stand? 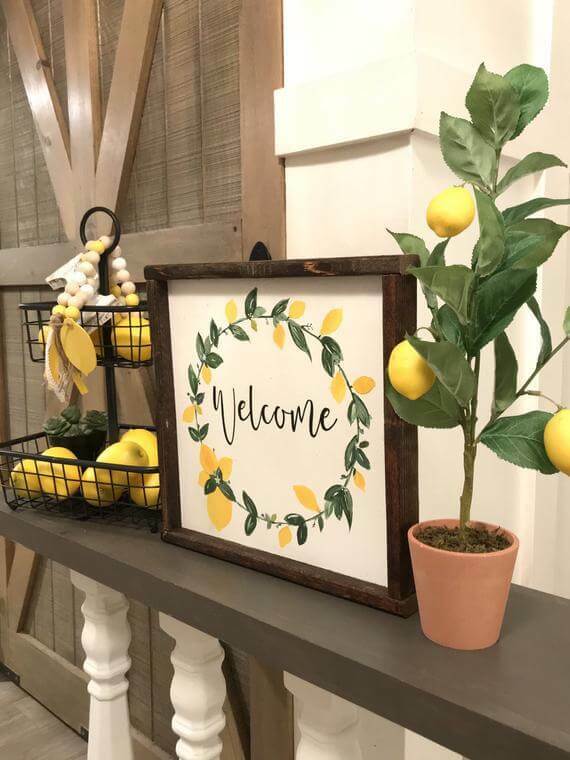 Whether you intend to sell lemons or not, the aesthetic is a must-have for farmhouses. 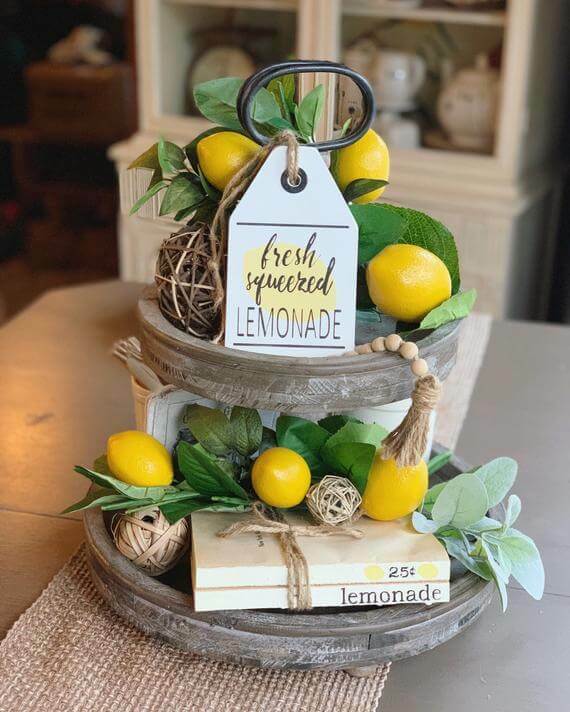 This wooden lemon sale tag is equipped with a twine ribbon that can be used with other decorative pieces or on its own. Either way, the tag is a small detail that provides authenticity. 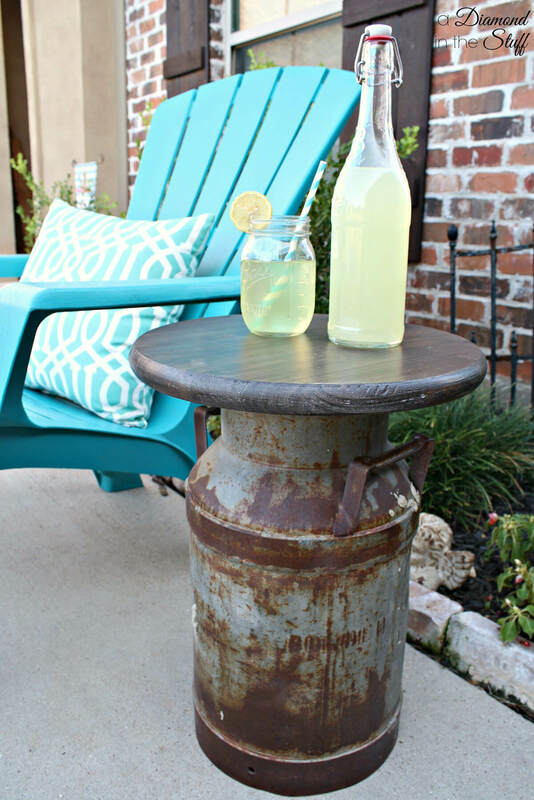 Milk cans happen to be just the right height for a perfect farmhouse-style side table. Often available at local flea markets, authentic vintage jugs are usually easy to find. Or, if you prefer, you could purchase the piece already made. Either way, this will make a great summery addition to any living room or patio. This wreath is also made from a bundle of grapevines that are carefully packed together to create a wonderful circle. Most of the wreath is covered with the vibrant colors of sunflowers and other beautiful flowers. Yet it’s the vibrant green leaves that draw the eye to the wreath in the first place. A beautiful bow offers a touch of rustic modernity. 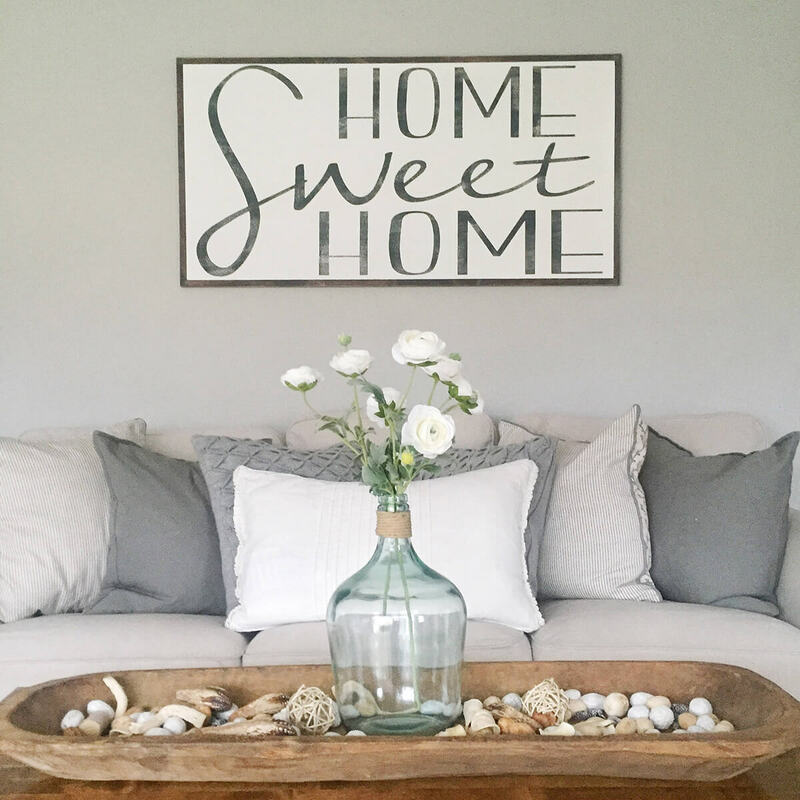 When summer rolls around and you want to dress up your living room, simply reach for those beachy shells and driftwood pieces and just like that you have transitioned into summer. 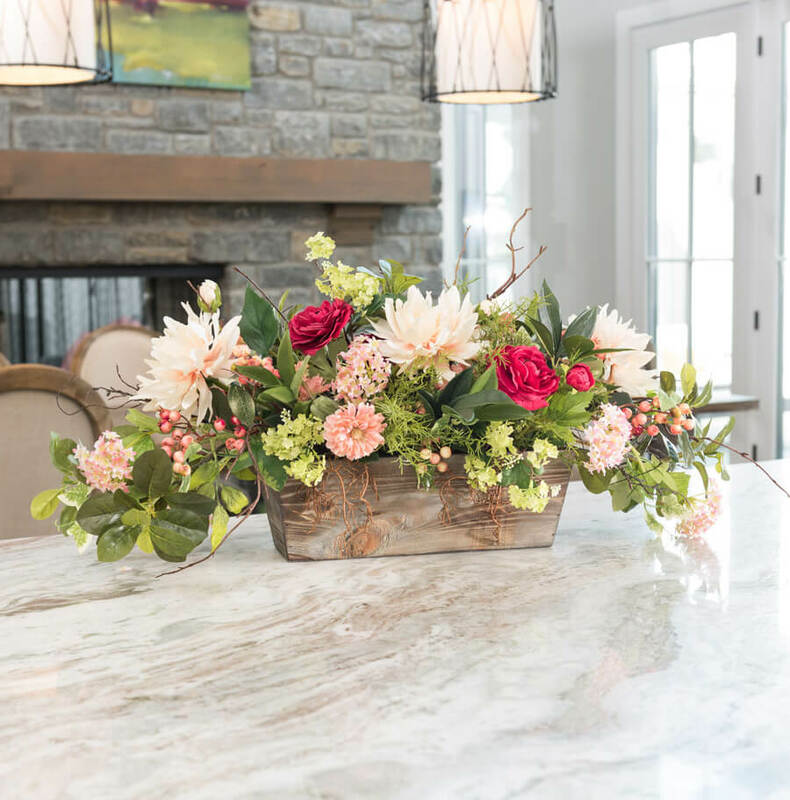 The addition of a gorgeous glass vase with your favorite flowers and a bit of twine or burlap adds height and gives the look a more farmhouse feel. When you want to add a big summer impact with just a small change, consider designing a beautiful blossoming basket. To keep the farmhouse vibe strong, use a natural wooden planter and consider colors that are bright and cheerful but maintain a delicate nature. You can use silk or fresh flowers, but keep in mind, of course, that fresh flowers require a bit of maintenance. 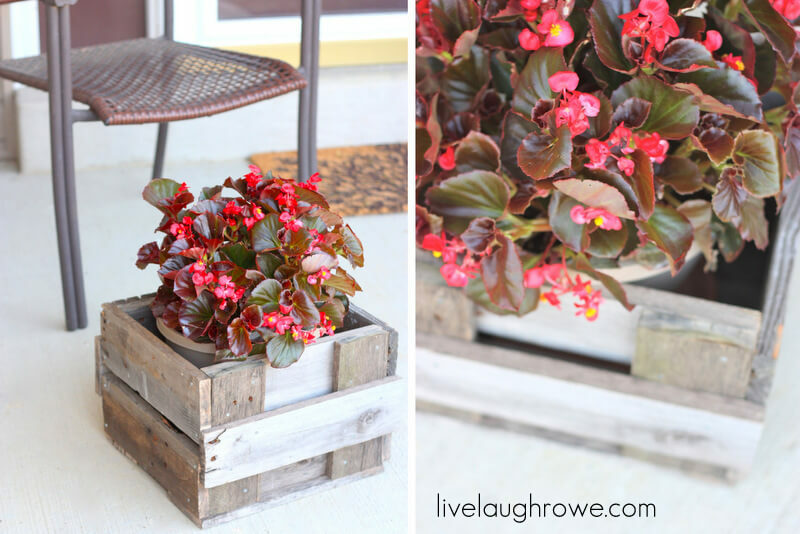 This lovely bare wood planter is perfect for housing your favorite porch plant. It provides a nice setting for your plant to grow and flourish, and with its rustic charm, it will blend well with any plant you choose. This project can be done easily at home with a small budget. 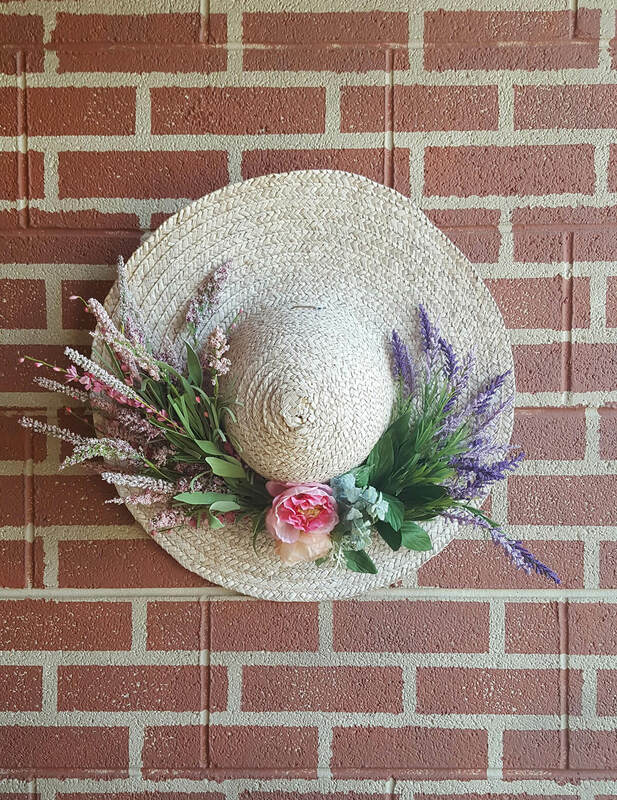 There is something whimsical and romantic about a straw hat outfitted with seasonal sprigs and flowers. This piece will take any wall from plain to perfect, bringing a smile to the face of your houseguests. This vintage-style hat reminds one of simpler days spent enjoying the garden and sipping lemonade. The perfect spot for a bright and beautiful floral display is in a Mason jar wall sconce. Simple, yet so impactful, these beautiful hanging jars can be large or small and hold whatever flowers inspire the summer sun lover in you. Add multiple sconces for an even brighter display. For any farmhouse summer decorations, no set is complete without including chicken wire. That’s exactly what this decoration provides. 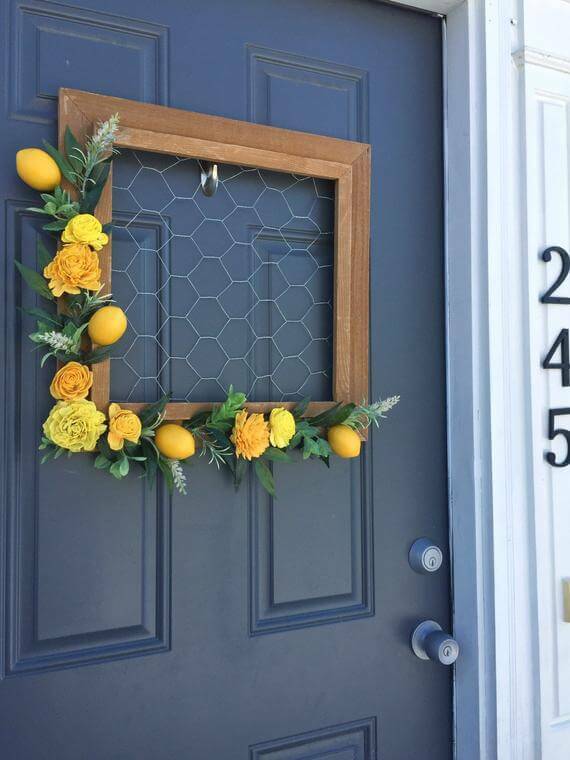 A wreath that is playful in its use with lemons decorating the distressed wooden frame. Its frame sits around the carefully arranged chicken wire to complete the aesthetic. Little lemon leaves rest around the fruit to add additional pops of color. Who doesn’t love an item that can be used for multiple purposes? That’s exactly what this sign offers. On the one side, you have a bubbly and sunny welcome to summer. Yet, when it starts to get cold, you can easily flip it around to welcome in the winter wonderland season. The distressed wood of the sign is perfect for any farmhouse. 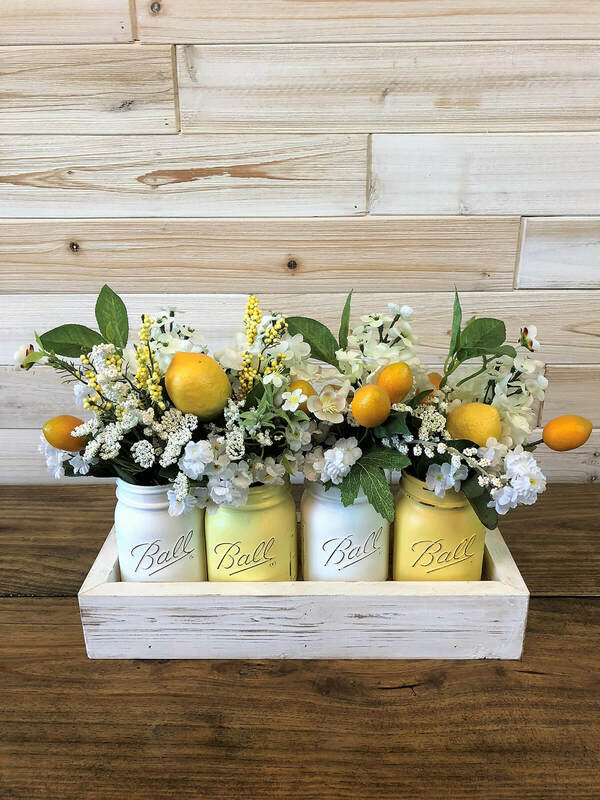 These bright and citrusy painted mason jars fit perfectly into this short wooden planter to create a beautiful display that looks almost like one big bouquet instead of four small ones. Yellow and white are the perfect color choices for a summer farmhouse feel, but feel free to experiment with your favorite summer palette. If you love flowers, then you should consider this beautiful array of blue and yellow flowers carefully arranged into a summer wreath. The colors alone suggest a summer filled with thriving adventure and warm days. 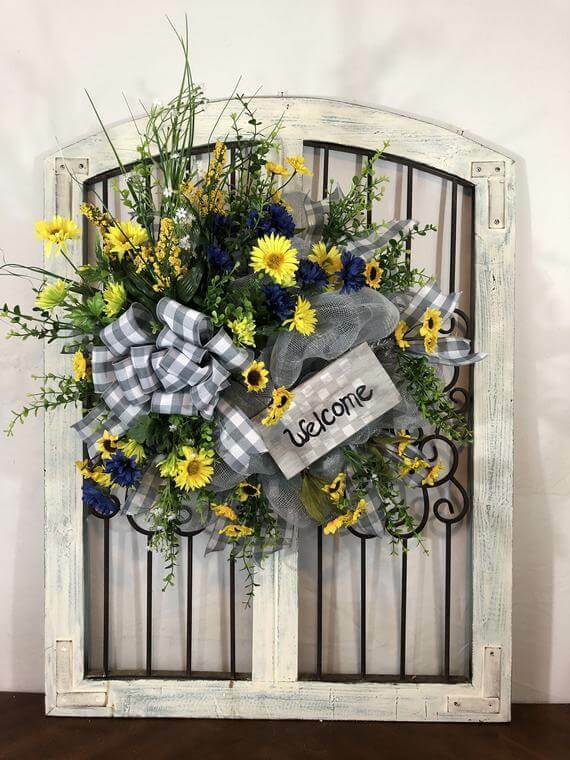 Besides the sunny welcome you offer with your flowers, this wreath also has a welcome sign itself with checkerboard paint making it pop against the flowers. You can bring the garden into your farm home with this warm and wonderful table arrangement. The wide petals of the sunflower are perfect for greeting anyone as they enter the room. A ribbon made of cloth and additional foliage continues the garden theme. Wrapping it all around a lantern with a candle makes it the perfect tabletop arrangement. Metal, wood, and flowers are the staples for when it comes to farmhouse aesthetics. This wreath uses all of that with its unique metal bicycle wheel providing the frame. A wooden sign with the words, “Family,” scrawled across it suggests that a warm and loving family reside within the home. The wreath is pulled together with elegant flowers along its frame. 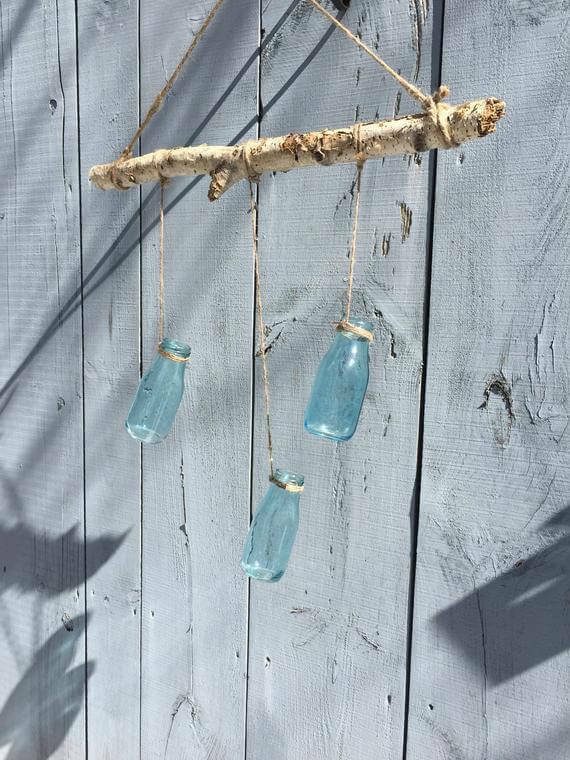 This beautiful hanging set with glass bottles is also multi-purpose. 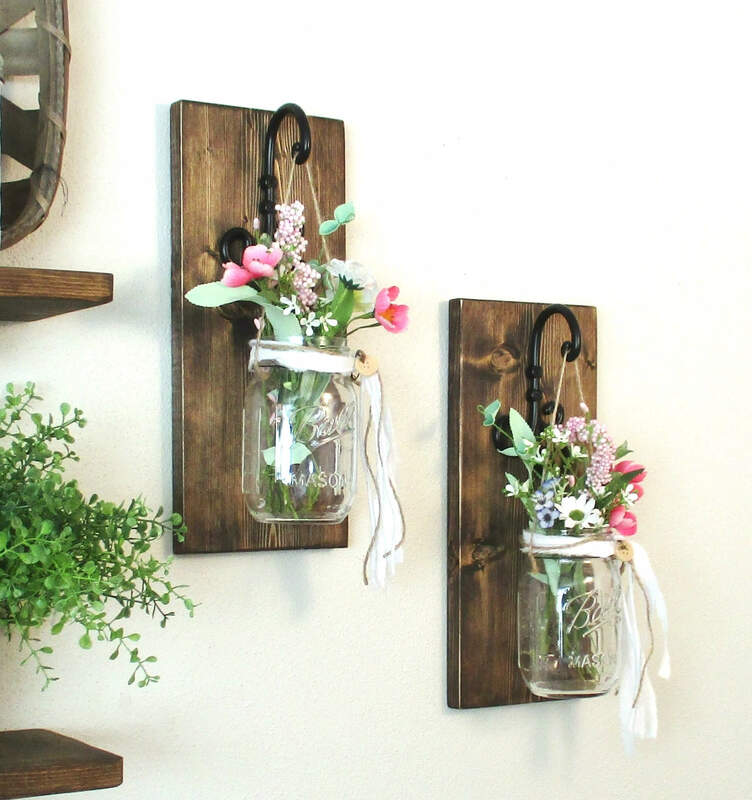 You can use it as a vase and fill each milk bottle with fresh flowers that can then be hung in any room. 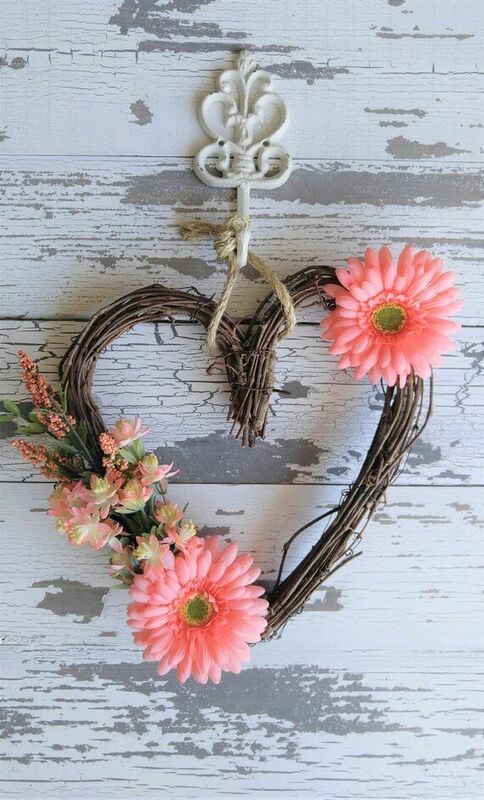 Or you can leave it as is and simply hang it above the dining table or on your porch as a unique welcome decoration for your guests. Once more, the use of burlap is used for this banner to usher in the summer season. You may think of a farmer’s market touting its wares at a stall with this decorative piece. 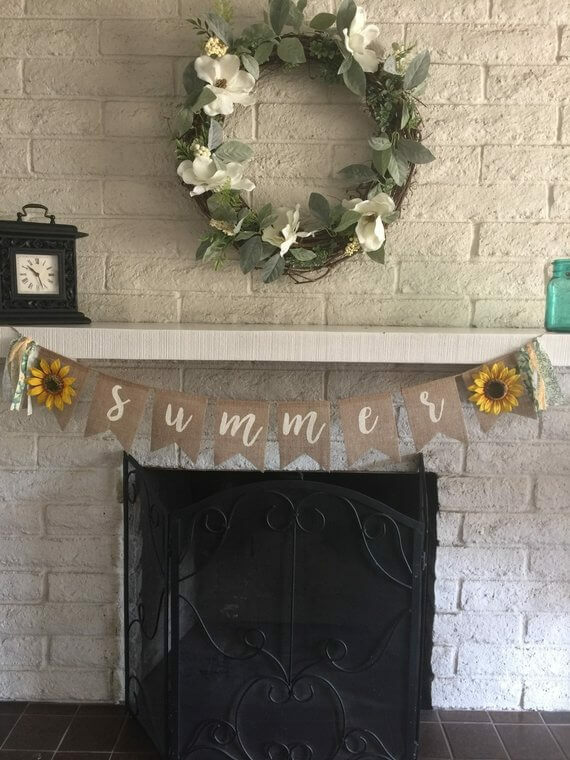 With that theme in mind, this banner uses a sunflower, a bit of paint, and garlands to make your welcome sign look like it’s won the state fair. 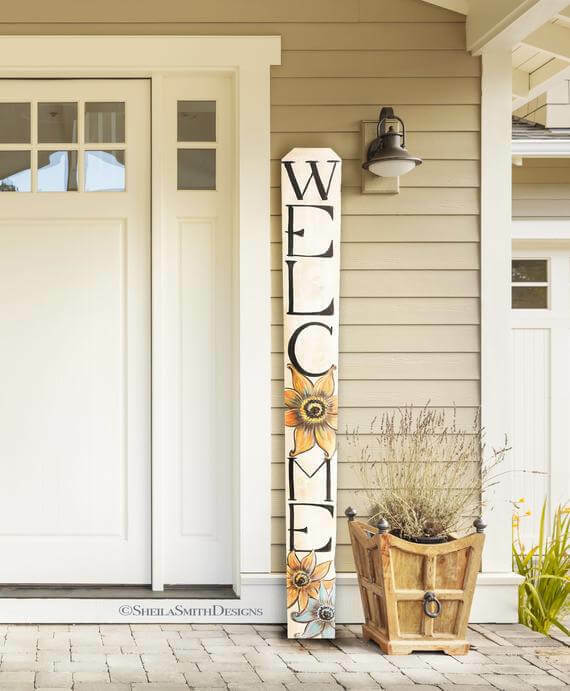 If wreaths really aren’t your thing and you already have a mat in front of your door, then you should consider this vertical welcome sign instead. It can easily rest just beside your door without taking up that much space. More importantly, the message itself is beautifully painted with sunflowers. The text for the message itself also harkens to farmhouse aesthetics. Lemons scream summertime. Their tart tangy taste paired with their bright yellow coloring remind everyone of long days and sunshine. 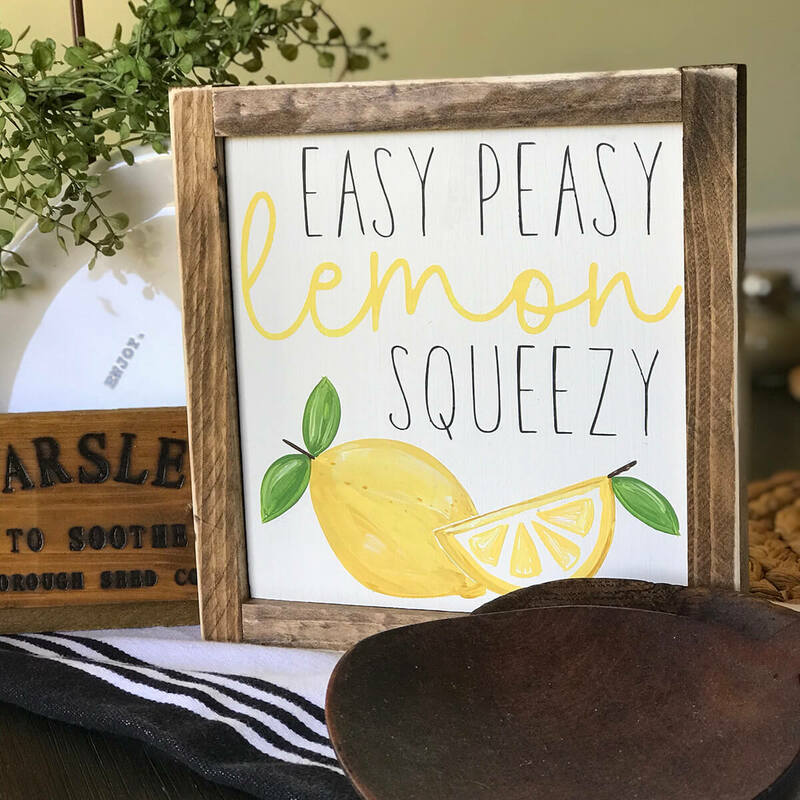 Incorporating a cute and playful lemon themed piece of art into your décor instantly adds a pop of summer appeal. Be sure to pick a style of frame and image that goes with your farmhouse theme. This sign truly expresses what everyone is thinking all summer: let’s go to the lake. 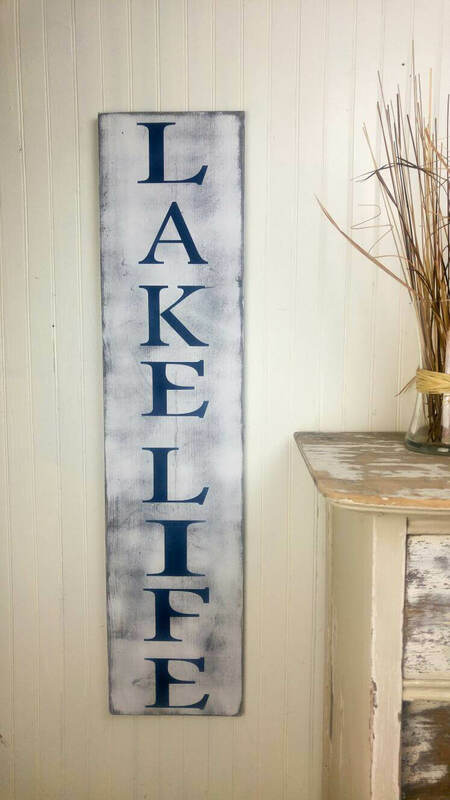 Paying homage to your favorite retreat is super cool when you have this awesome lake blue vintage sign. Throw this up when you are ready to head to the lake, or even when you are just dreaming about it. 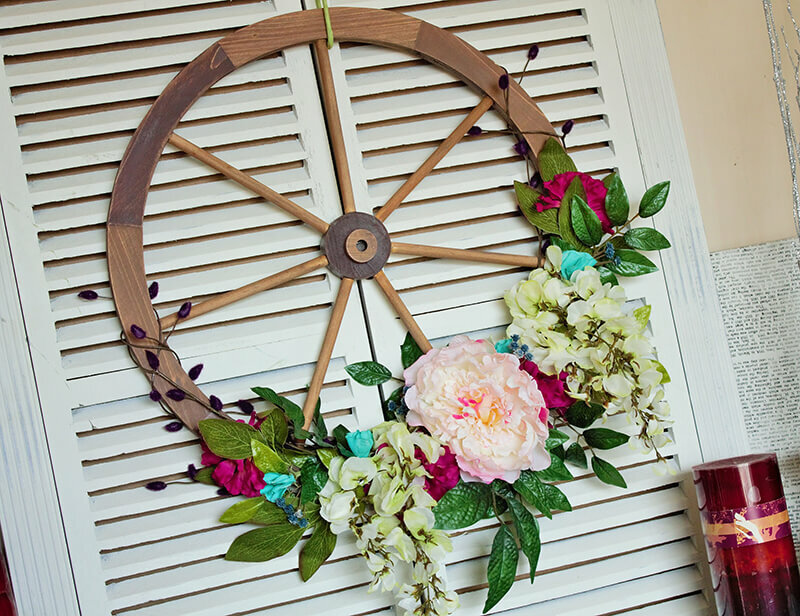 What better way to greet your guests into your farmhouse than with a bright and sunny wreath? 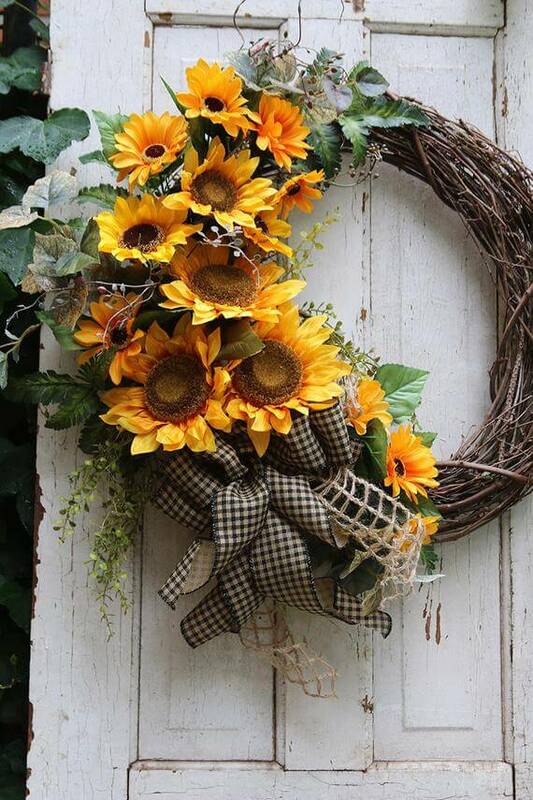 This sunflower wreath looks absolutely beautiful hanging on any door of your home. An earthy ribbon literally ties it all together. With the wooden wicker branches weaved together to form the wreath, this decoration is perfect for any farmhouse in the summer. Besides just rustic farmhouses, many people are also looking to utilize an industrial farmhouse aesthetic. The perfect way to do that is to use metal and wood. That’s exactly what this decoration offers. 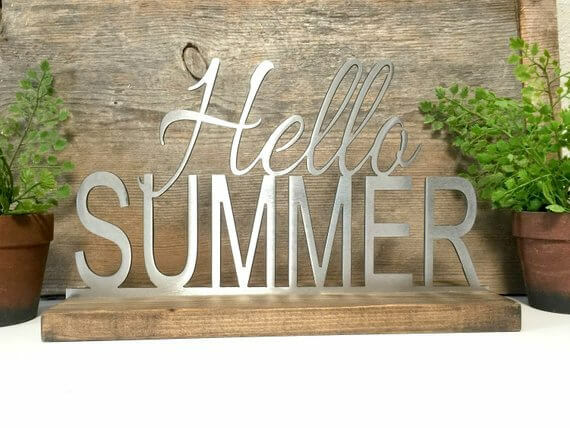 Beautiful metal is carved and forged into an enthusiastic greeting for summer. It’s placed on a thick slab of wood which can be easily placed on a table or bookshelf. Nothing quite says spring and summer like lilacs. 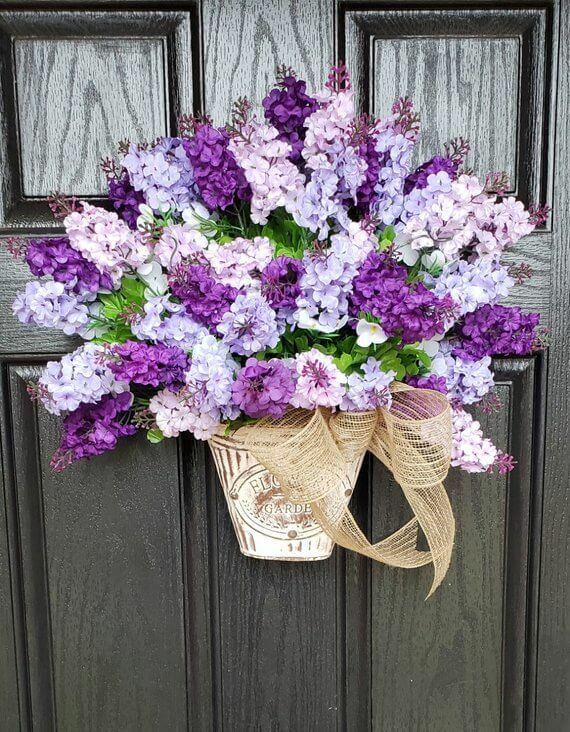 This wreath combines varying shades of the beautiful lilac flowers that are carefully arranged within their holder. While the flowers seem expansive and wide like a fan, they’re situated just enough to make everything flow beautifully rather than just looking messy. This floral arrangement and wreath provide a warm welcome to everyone. Sometimes simplicity is all that matters. That’s exactly what this piece provides. 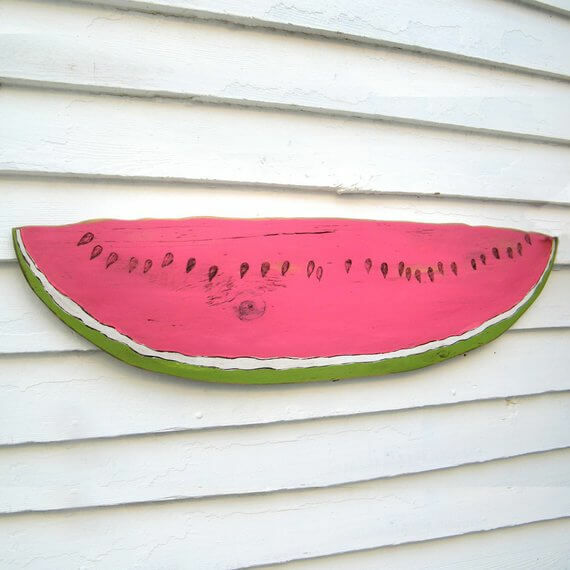 A big slice of watermelon is the perfect decoration for a farmhouse that loves watermelon or fruit in general. Typically used to sell wares, this sign can be placed on the side of your home to invoke that summer feeling. Beginning with the wooden letters, this wreath is an excellent addition to your farmhouse summer decorative set. The wooden letters alone speak to that farm and barn aesthetic. When it comes to the flowers, they’re almost like an icing on top. Beautiful pops of color situated all woven together in a way that makes it look as though the wreath is floating. An extremely cool way to have authentic farmhouse decorations is to utilize materials found on an actual farm. This wreath does just that by using grapevines as a material for forming the wreath. It’s also easily bendable which allows it to be shaped like a heart. This wreath is warm-welcoming and beautiful with its use of pink flowers to add a blast of color. 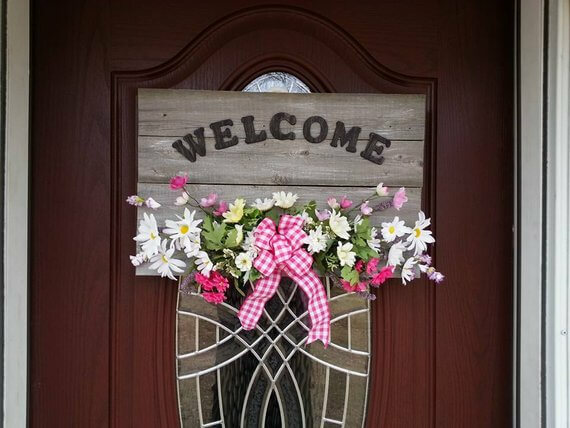 Wreaths are an excellent way to greet a guest to your home. However, to make it truly personal and custom, you should consider a wreath with a letter of your family’s name. 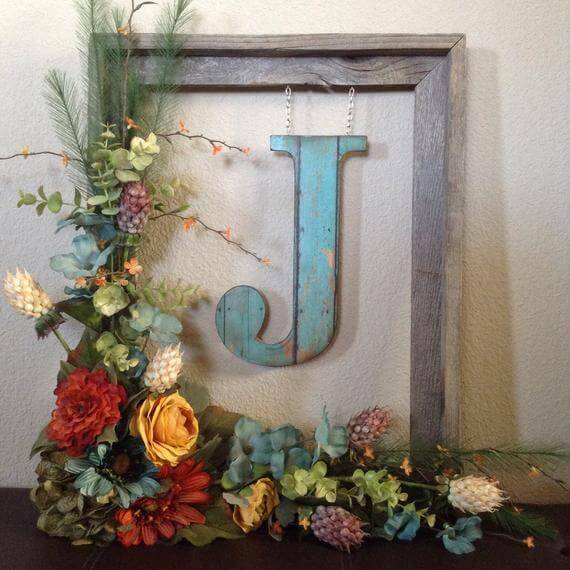 This rustic wreath uses an elegantly worn letter that rests within a wooden picture frame. 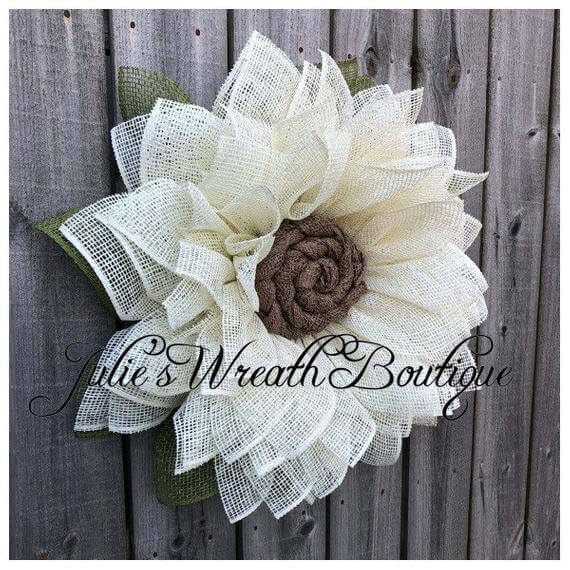 Beautiful and thriving flowers weave around the frame to add authenticity to this unique wreath. What says summer more than lemons? 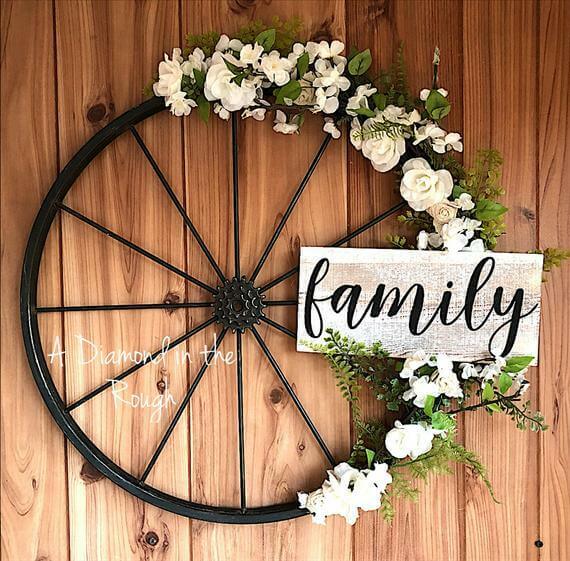 This decorative set is perfect for farmhouse decorations in the summer because it utilizes many different items typically found within a farmhouse like baskets and wooden frames and plants. As a whole, this decorative set suggests a refreshing summer during the hot days. These items can be placed anywhere in the home and look great. A wreath that you can use each year to greet the summer season is this one made of dried flowers. Because they’re dried and preserved, these flowers will last considerably longer than fresh flowers. They also are used with wispy strands of straw and twine to bring about an image of a farmhouse alone on the wild but isolated plains. 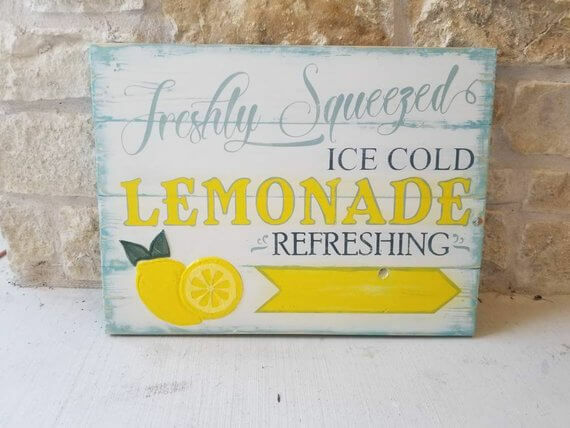 Once more, for those who love to have a lemon theme for their farmhouse decorations in the summer, this sign is a must-have. The sign is painted on wood which makes it with your other farmhouse decorations from the start. This sign can be easily hung on any wall or even just carefully set on a mantlepiece or shelf. What farmhouse summer decorative set is complete without a wagon wheel? This wreath uses the circular shape of a wagon wheel to fix its decorations upon. While the eye is first drawn to the center of the wheel, it isn’t there long, as the absolutely beautiful flowers soon attract attention. Their careful weaving along the wood makes this piece look elegant. 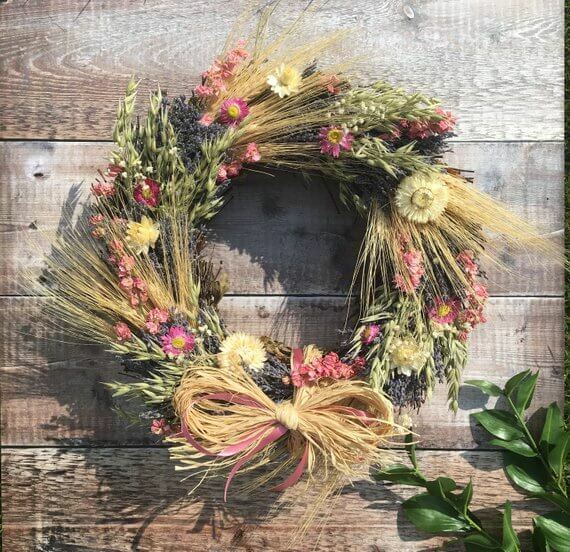 For those individuals who love the idea of a sunflower wreath but aren’t a fan of fake flowers or seeing their flowers wilt over time, then one of the coolest farmhouse summer decorations that you should consider is a burlap sunflower wreath. 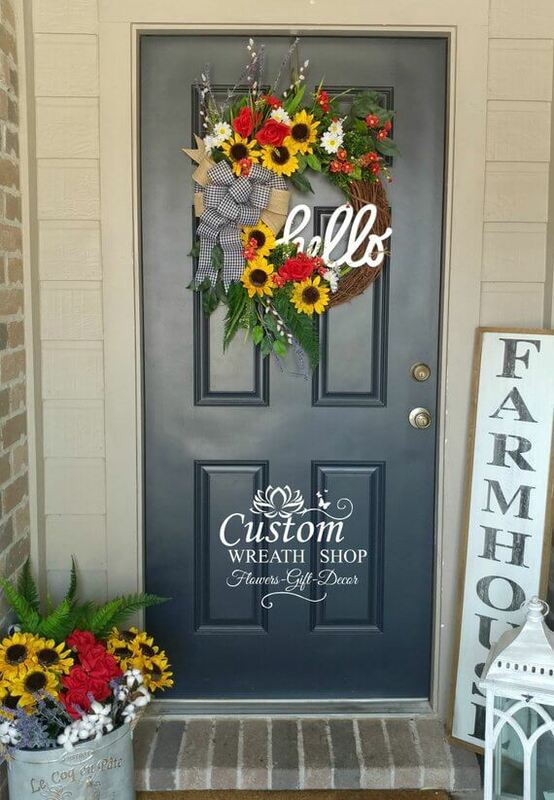 Not only is burlap a necessity for farmhouse aesthetics, but this sunflower wreath is incredibly unique and elegant. Pillows are an excellent method of decorating. You can practically place them anywhere. 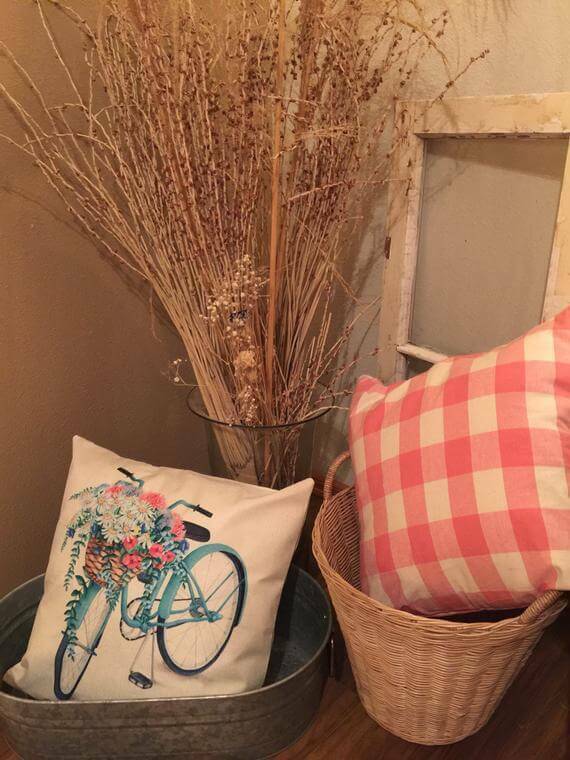 This pillow, which features a vintage bike with a basket packed full of colorful flowers, is an excellent addition to your farmhouse summer decorations. It can be placed on a couch, table, or even a wooden bench to bring in that vintage and rustic aesthetic.